When looking to acquire a tray many people are unsure where to begin. A good start is to consider ‘What is the purpose of this tray?’ There are many types of antique trays available reflecting their different functions. The term “tray” is derived from the English word ‘trēg’ or ‘trīg’ which connotes a ‘flat board with a low rim.’ In essence a tray is a shallow, flat container which can be produced from various metals including silver and brass, wood and in some cases papier-mâché. 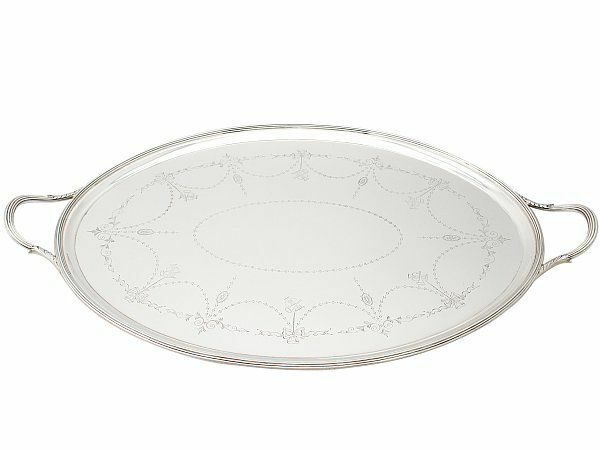 The plain oval tray became popular in the late 1700’s. 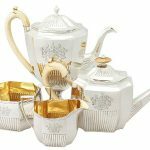 By the 19th century carrying handles were added to large sized salvers to accommodate the increasingly weighty tea and coffee services. A tea tray is literally and figuratively the foundation of formal tea preparation. It offers a surface for tea preparation including setting out the cups, pouring the tea, and then the tray is used to take the cups to the guests or to the table where tea is going to be served. 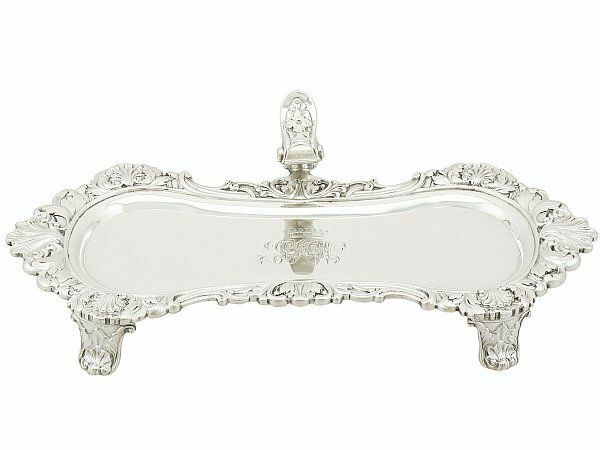 This is a rather traditional use of a tea tray and for many owning such items made in sterling silver is a sign of wealth. 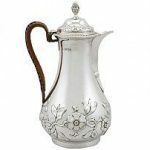 For some, using a fine silver tea trays is to impress their guests. Yet there are also many people who simply have an impressive tray as a focal point in a room and it’s never actually used for serving purposes. How to know if you have found a tea tray…? Tea trays are often oval or rectangular in shape and will be two-handled. They will be sturdy in order to hold the weight of the tea set (and in some cases cups). Similar to the tea tray the drinks tray is often used on special occasions. The tray provides a suitable on which drinks may be presented at such events. Gallery trays are made in either wood or metal, with higher sides than the traditional tray, providing more security, preventing items from slipping or tipping off the surface of the tray. How to know if you have found a drinks tray…? The drinks tray will look similar to the tea tray, being of similar shape, having handles but it will be of a smaller size than the tea tray. 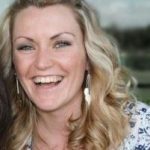 How to know if you have found a gallery tray…? These pieces are quite easy to spot as they have raised sides (gallery) around the tray, often with fully integrated handles. 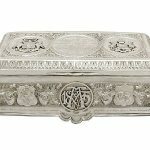 The more impressive gallery trays have pieced decorated sides embellished with fine detailed designs. 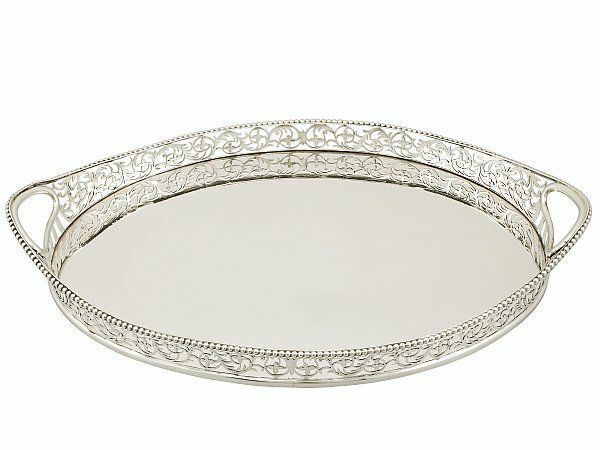 Such trays are often made of silver and maybe used to serve drinks. Unlike the above snuffer trays weren’t used to serve drinks they were produced so households had a receptacle to hold their candle snuffer on once used. Wees B.C (1997) English, Irish & Scottish Silver at the Sterling and Francine Clark Art Institute. How to know if you have found a snuffer tray…? 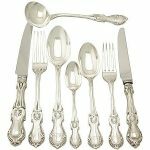 Although the above details some of the most popular types of serving trays, you may also discover more variations of the tray, such as salvers and waiters. When deciding on what type of tray to buy you need to decide if you want the tray for a specific purpose and which type of tray will suit that best, then consider material (clearly we vote for silver) and lastly, but more importantly, ensure it fits within your available budget.